It's not hard to tell that the owners of this Mexican bodega and restaurant are proud of their home state of Guerrero as the coat of arms is displayed proudly on the outside awning and menu. Opening up the door, the store opens spaciously with the food preparations on the left and colorful piñatas overhead. 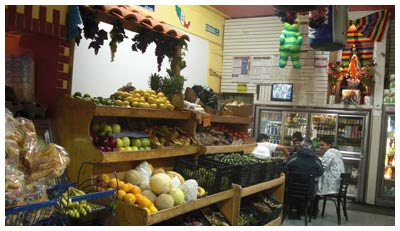 Normal convenience store goods mix with fresh fruit, Mexican fresh and dried products, and a small seating area towards the back. I decided to order a couple different items to get a good sampling of the menu and ingredients used and first chose the huarache ($3.50, below) for which I topped it with carnitas, a slightly crispy fried pork. It was hands down the best huarache I have had in New York, with a perfect sandal tortilla filled with a thin layer of beans then topped with the meat, a layer of green salsa within, and all the fix ins. Less delicious was the tostada de pollo ($2.50, below), although the chicken should be noted for a wonderful kick from the red chipotle sauce it is cooked in. I was slightly surprised that the whole thing was served cold, and while this did not make it inedible by any means, I would have preferred my meat to be warm. The cooking all seemed to be geared towards takeout, as three groups ahead of us took their bags when called and left. Foreseeing having the order wrapped up, I stepped forward to say I would be dining in and was met by surprise by the lady who could not see over the comically high counter. There was a group of four men enjoying their cemitas and a 2-liter of Coke, and we asked to share the back tables with them. Once the food was devoured, I began to enjoy the feel of the place even more, with our friendly table mates laughing and the upbeat salsa music. The only unfortunate part of the place is that despite the large glass refrigerators full of tempting cold beer, you are not allowed to drink alcohol in the restaurant, which would make for a perfect way to wash it all down.